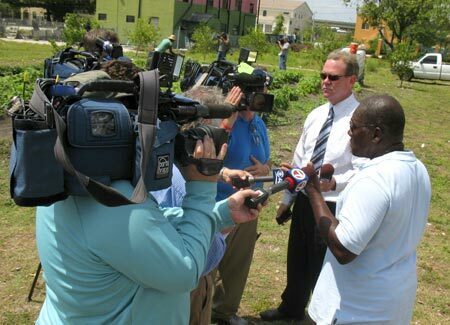 Dr. Marvin Dunn tells it like it is, while Local 10’s Todd Tongen looks on. This Wednesday things were definitely not business as usual at the Roots in the City Farmers Market in Overtown. All the vendors were gone — no Nature Boyz, no Redland Organics, no Hani’s goat cheese. Members of the media, including three TV stations and four bloggers, were interviewing curious neighbors, and protesters with signs milled around. Only one tent belonging to RITC was up at noon, and market manager Maggi Pons was stacking collards, yellow squash, scallions and other produce as if it were a normal day at the market. Only she wasn’t selling — she was giving it all away because the market couldn’t sell anything. Maggi Pons, RITC market manager, and the media. Mayor Tomas Regalado sent two spokesmen to try to smooth the waters and clarify the situation. Alan Morley insisted that the mayor “loves the market.” He explained the city only wants the market to get the proper permits and licensing, not shut it down, and they have until the weekend to comply. “Certain criteria have to be met. They didn’t go through the right permit process,” he stressed. Asha Loring came to shop and joined the protest. Not all the vendors were happy about a day off. Instead of selling produce on Wednesday, Farmer Margie Pikarsky of Bee Heaven Farm stayed home. “Since we won’t be there, we won’t be bringing fresh, local, organic veggies to the underserved, food desert neighborhood. And, we won’t be employing the local resident that helps us with the setup and breakdown each week. How does that help anyone? ?” she said. Neighbor James Branson is thankful for the food. Wednesday’s free food giveaway was a big hit with the neighbors. Three women staggered away with four grocery bags brimming with collards and other produce. Area resident James Branson was delirious about his full shopping bag. “God is good,” he exclaimed, pointing to the sky. “Give thanks for the food on the table!” Neighbors who came late were disappointed. By 1:20 p.m. the RITC tables were completely empty of produce and the tent came down. Giving food away may work in the short term, but in the long term it’s not a solution to either the problem of permits and codes — or developing a local food economy. It appears the City of Miami doesn’t have an ordinance that specifically applies to farmers markets. Spokesman Santangelo called the situation with RITC “a good learning process” for market people to learn how to comply with existing regulations. Yet he gave no answer when asked how the city can help this market (or others) navigate the permitting process smoothly and quickly. Fresh veggies up for grabs. The local food movement is growing, but it’s a slow and painful process. For every step forward, it appears there are two steps back. 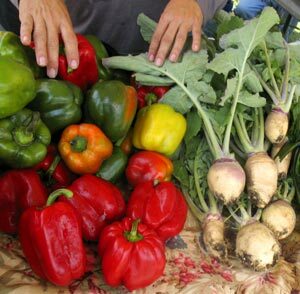 Farmers markets are the best way for small local growers to find buyers, and for buyers to find fresh, local produce at a fair price, especially in underserved neighborhoods. Instead of trying to shoehorn market compliance into codes that were written to address different situations that don’t quite fit, perhaps a new ordinance needs to be passed to support markets and allow the local food scene to flourish. 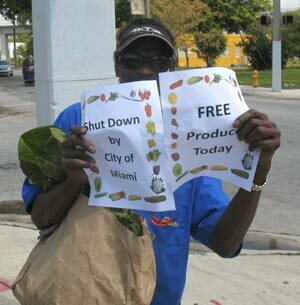 (While Miami takes a tough stance on code enforcement, South Miami willingly embraces its new grower supported market.) Whichever the city, the most important thing is to get fresh food into the hands of people who need it most and have grown to count on it. 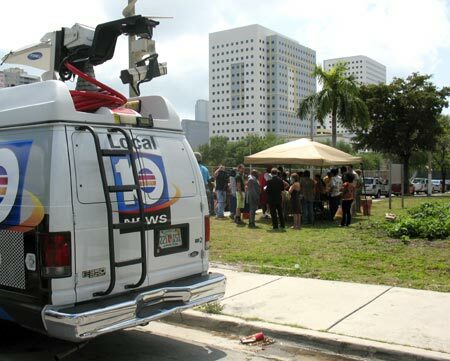 Read about the protest at CBS 4, Local 10 and the Miami Herald here and here. Mango & Lime has a thoughtful post and an update about zoning and permits (at the bottom of the page). Read Dr. Marvin Dunn’s letter to the editor in the Miami Herald. Read Commissioner Richard Dunn’s letter to the editor here. 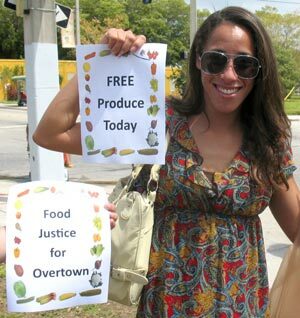 Read about Dr. Dunn’s “Food Justice for Overtown” protest here. Read about Marvin Dunn’s negotiations with the Overtown CRA officials here. 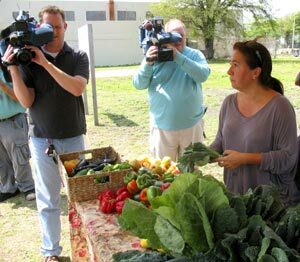 RITC Farmers Market got media attention.